Valentine’s Day has been celebrated on February 14 for centuries. It is a festival of romantic love and many people give cards, letters, flowers or presents to their beloved. They may also arrange a romantic meal in a restaurant or night in a hotel. Common symbols of Valentine’s Day are hearts, red roses, and Cupid. 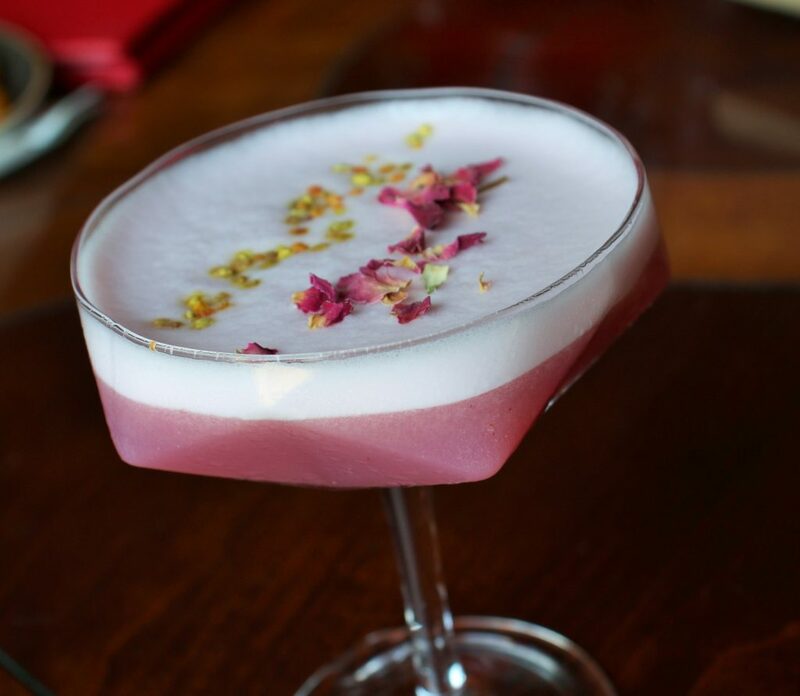 Some people sip pink champagne and some expect an exciting new surprise in the form of a creative and romantic cocktail. From the Hotel Sacher in Vienna to the Four Seasons Biltmore in Santa Barbara talented cocktail entrepreneurs will be mixing up some pretty saucy cocktails to warm the hearts of local sweethearts enjoying the annual holiday that pays homage to true love, and I’ve collected a few from my travels around the world for you to consider adding to your repertoire for enjoyment on the anniversary of this ‘be mine’ night to remember. 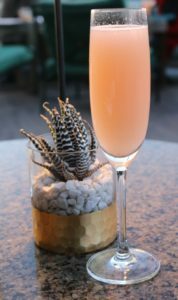 The bar at Jean-Georges Rooftop Restaurant in the Waldorf-Astoria, Beverly Hills serves one of the most beautiful peach mimosa’s in the world to enjoy with the heavenly Hollywood Views. www.jean-georges.com. 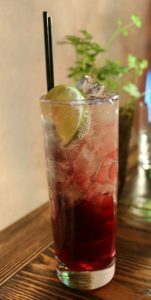 The Malibu Beach Inn’s Carbon Beach Club serves a sensational pink imported wine Baracchi Rose to enjoy as the waves come crashing in that I just adore. www.malibubeachinn.com. 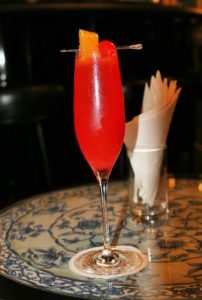 When in Vienna, Austria at Hotel Sacher in the Blau Bar the ideal chic drink is the Anna Sacher Cocktail, named in honor of the amazing woman hotelier who kept Sacher Hotel on top for centuries. www.sacher.com/en/hotel-sacher-wien. Sauska Rose Champagne is the first choice at the Four Seasons Gresham Palace in Budapest and is sipped from rare Hungarian crystal flutes during their show-stopping Heren Tea. www.fourseasons.com/budapest. For the ladies who prefer lovely non-alcoholic beverages my favorite can be found at The Monarch in the Montecito Inn, where they mix me a cranberry with sparkling water and lime that is perfect, however, I’m told their Chaplin’s Lounge has perfect martini’s and an amazing cocktail menu. www.themonarchmontecito.com. Rodney’s Steak House in the new Hilton Santa Barbara Beach Resort offers one beautiful looking Cosmo to savor with one of their fine aged steaks. www.hiltonsantabarbarabeachfrontresort.com. 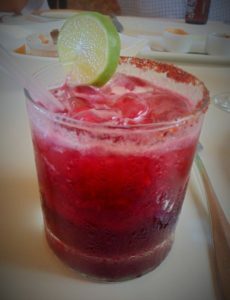 If you are lucky enough to be in Puerto Vallarta, Mexico at La Palapa on the beach please enjoy the rich color and taste of their XAICA hibiscus margarita www.lapalapapv.com, a perfect compliment to your special evening. My friend the Chef in the Hat at Loulay, located in the Sheraton Grand Seattle has an unforgettable pink cocktail to compliment his outstanding French cuisine. www.thechefinthehat.com/loulay-kitchen-seattle. If you are just wine hopping in the Santa Barbara area Funk Zone do stop in at Les Marchands and ask for the Pink Surprise Cocktail their bar guy is whipping up to please guests. 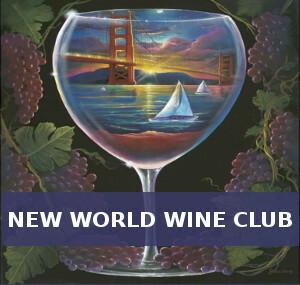 www.lesmarchandswine.com. It sparkles in the candlelight and will warm your little valentine heart for a perfect beginning or ending to your night of fun and love. Happy Valentines Day! Bonnie Carroll has been a food/travel/lifestyle writer since 1983. She is the founder & publisher of Bonnie Carroll’s Life Bites News (www.lifebitesnews.com), award-winning blogger, does travel, entertainment and food reporting on local Radio/TV, and contributes to a variety of national and international travel/lifestyle publications. She is a member of IFWTWA and NATJA. Contact her at writebc@aol.com.